There’s still some time before Samsung officially announces its new duo of Galaxy Tab S tablets on June 12. 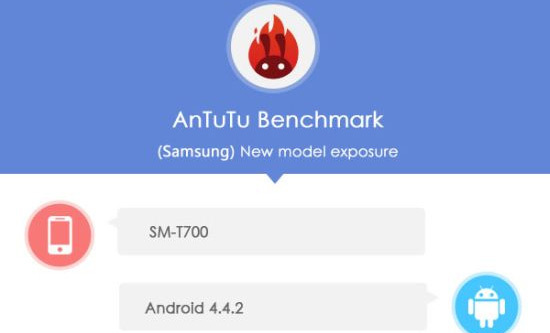 We already have a general idea of what they’re all about, especially the Galaxy Tab S 10.5″ one, but thanks to a listing from the AnTuTu Benchmark database, we can now see the Galaxy Tab S 8.4 key specs. Carrying the model number SM-T700, the 8.4″ Tab S rocks an Exynos 5 Octa 5420 chipset with 1.9 GHz quad-core ARM Cortex-A15 and 1.3 GHz quad-core ARM Cortex-A7 CPUs. They’re bundled with an 533MHz ARM Mali-T628 and 3GB of RAM. Internal memory is 32GB, which should be expandable via a microSD card slot, but that’s not yet specified. It’s no secret that the 8.4″ display is of the Super AMOLED kind and that it runs a 2560 x 1600 pixels resolution. That makes up for a great pixel density of 359ppi resulting in super sharp and crisp viewing experience. Naturally, going for Super AMOLED means the Tab S is also going to have vivid colors, too. Samsung has also thrown in a couple of cameras – an 8MP shooter at the back and 2.0MP at the front. The Galaxy Tab S 8.4″ is going to ship with Android 4.4.2 KitKat. Overall, the Galaxy Tab S 8.4″ is no slouch and the scoreboard shows it managed to do 35,713 points in AnTuTu 4.0. This kind of performance won’t come cheap. As a recent price leak suggests, the Galaxy Tab S 10.5 and Galaxy Tab S 8.4 will retail in Europe for about €560 and €449, respectively.